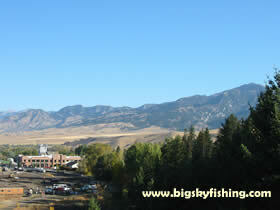 Bozeman is located at the center of North America's best wild trout rivers. The seasoned crew at Montana Angler Fly Fishing offers guided day trips and multi-day fishing packages near Bozeman. Outfitter #10770. Bozeman lies in one of the fastest growing areas of Montana. Lying in the beautiful Gallatin Valley, Bozeman has been attracting numerous new residents over the past two decades. Bozeman was one of the first Montana towns to truly be hit by an influx of new people, who were drawn to Bozeman primarily by its location in this very scenic area of Montana. The towns location near three major ski areas and its proximity to Yellowstone National Park have combined to make Bozeman a gateway for people moving to Montana. Additionally, Bozeman was also one of the first areas of the state to have a mass of summer homes and trophy homes built in the area. And this trend continues, despite the Great Recession slowing the process down a bit. So prolific is the building in Bozeman and the surrounding area, that, somewhat incredibly, more than 20,000 subdivision plats have been drawn up for future development. Whether all these subdivisions actually occur, of course, is a different matter. But, my guess is that this area will continue to grow rapidly – attracting both new permanent Montana residents as well as serving as a major place for the building of summer homes and other similar “trophy homes” that are also springing up over the rest of Montana now. Of course, Bozeman is more than trophy homes and unending subdivisions. Serving as home to Montana State University, Bozeman has had a solid economy for many, many years. The towns location near Yellowstone National Park and its’ proximity to quality fly fishing have been drawing tourists for decades. The actual city of Bozeman reflects both the recent building spree that has been going on as well as its desirability as a tourist destination. 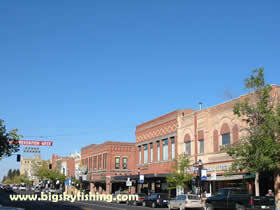 Downtown Bozeman is clean, well-kept and has dozens of specialty stores downtown. Any tourist who pops into downtown Bozeman will find plenty to do and many restaurants and shops to explore. Reflecting its large contingent of college students, Bozeman also has a very young feel about it. Anyone walking down the streets in downtown will see hordes of college students – frequently with their dogs –everywhere. Yet, Bozeman is hardly a rowdy college town. Instead, for a college town, Bozeman is pretty laid back and relaxed – most likely owing to its location (why party downtown when you can go play and party up in the mountains? ).